Mary Sarah Bergh, DVM, MS, DACVS, DACVSMR, is an affiliate associate professor at Iowa State University and a small animal surgeon at Edinger Surgical Options in Madison, Wisconsin. Dr. Bergh completed an internship at University of Pennsylvania and a residency in small animal surgery at The Ohio State University. Her clinical and research interests include rehabilitation therapy, joint replacement, arthroscopy, treatments for cranial cruciate ligament disease, and sporting injuries. Muscles and tendons are essential parts of the musculoskeletal system that allow standing, ambulating, and flexion and extension of joints. Injuries can be caused by external trauma (eg, vehicular accident), internal trauma from fracture fragments, or, most commonly, repetitive fatigue and/or application of supraphysiologic forces. A good working knowledge of musculoskeletal anatomy is important to understand the clinical impact of injuries to the muscle–tendon unit (ie, strains). Strains are common in small animals and should be included in the differential list for any type of lameness or decrease in working or sporting performance. Clinicians should always take a complete history, perform a thorough examination, and obtain radiographs of the affected region to evaluate bony structures. Ultrasonography, CT, and MRI offer more complete evaluation of the muscle–tendon unit and can aid in diagnosis and guide treatment. Following are the author’s most common muscle and tendon injuries to consider in the lame patient. 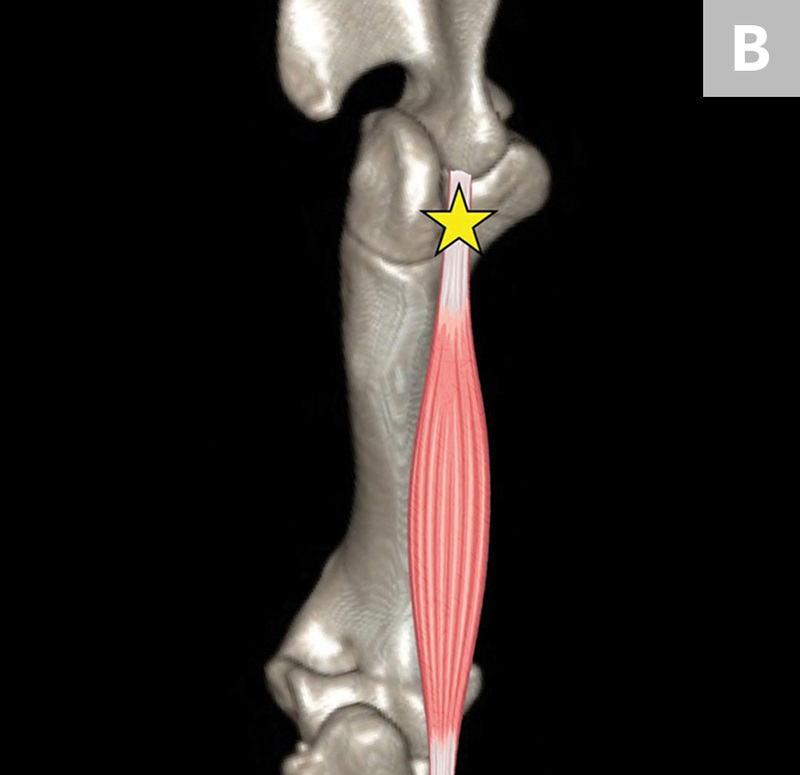 FIGURE 1 Arthroscopic image of the shoulder joint of a dog with biceps tenosynovitis. The biceps tendon (B) originates on the supraglenoid tuberosity of the scapula (A) and traverses distally through the bicipital groove of the humerus (closed arrowheads). Synovitis and increased vascularity of the tendon sheath are present (open arrowheads). 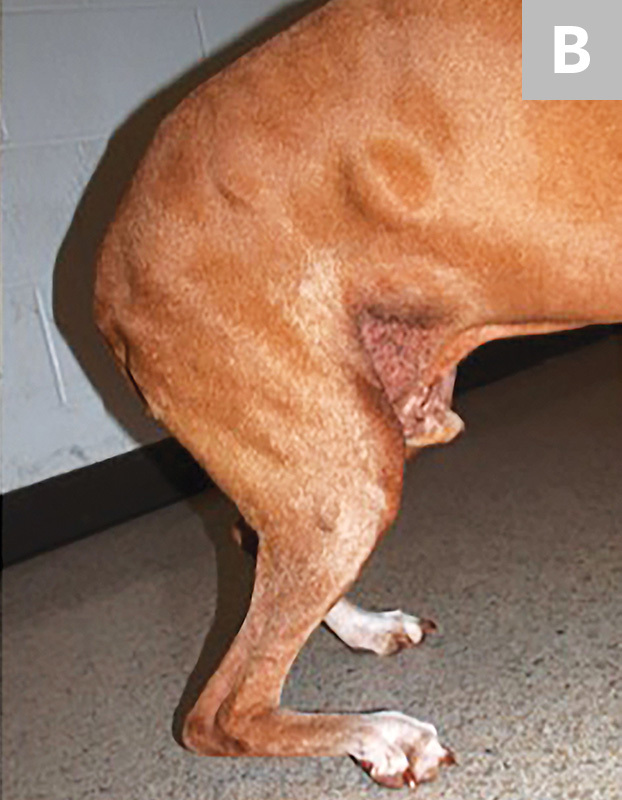 FIGURE 2 Left shoulder of a dog with severe muscle atrophy of the supraspinatus (S) and infraspinatus (I) muscles. The outline of the scapula and the prominent spine of the scapula (arrowheads) are visible. FIGURE 3A Pain caused by biceps tenosynovitis may be elicited with the biceps test (A). During this maneuver, the shoulder is flexed, the elbow is extended, and pressure is applied on the biceps tendon in the intertubercular groove. This region is located on the medial aspect of the proximal humerus (B; star). FIGURE 3B Pain caused by biceps tenosynovitis may be elicited with the biceps test (A). During this maneuver, the shoulder is flexed, the elbow is extended, and pressure is applied on the biceps tendon in the intertubercular groove. This region is located on the medial aspect of the proximal humerus (B; star). FIGURE 4 Two clinical presentations of Achilles tendon injury. A complete plantigrade stance with relaxed toe position, with complete rupture of the 3 components of the Achilles tendon (A), is present. Increased flexion angle of the tarsus with curling or flexion of the digits is present when the gastrocnemius tendon is ruptured and the superficial digital flexor tendon is intact (B). FIGURE 5 Ventrodorsal radiographic projection of a 9-year-old dog with right hindlimb lameness and hip pain. In addition to bilateral hip dysplasia and secondary osteoarthritis, mineralization is present within the right iliopsoas muscle near the tendon insertion on the lesser trochanter (arrowhead), which indicates a chronic strain injury. FIGURE 6 Longitudinal ultrasonic view of the left iliopsoas muscle in a different dog with a moderate strain. In the caudal third of the muscle, a region of decreased echogenicity with disruption of the muscular fibers is present (dotted lines). Platelet-rich plasma was injected into this site under ultrasound guidance. FIGURE 7 Characteristic gait abnormality in a patient with infraspinatus muscle contracture. The limb is held in an abducted and externally rotated position and is circumducted with the elbow partially flexed when ambulating. Stobie D, Wallace LJ, Lipowitz AJ, King V, Lund EM. Chronic bicipital tenosynovitis in dogs: 29 cases (1985-1992). J Am Vet Med Assoc. 1995;207(2): 201-207. Bruce WJ, Burbidge HM, Bray JP, Broome CJ. Bicipital tendinitis and tenosynovitis in the dog: a study of 15 cases. N Z Vet J. 2000;48(2):44-52. Davidson EB, Griffey SM, Vasseur PB, Shields SL. Histopathological, radiographic, and arthrographic comparison of the biceps tendon in normal dogs and dogs with biceps tenosynovitis. J Am Anim Hosp Assoc. 2000;36(6):522-530. Shani J, Shahar R. Repair of chronic complete traumatic rupture of the common calcaneal tendon in a dog using a fascia lata graft. Vet Comp Orthop Traum. 2000;13(2):104-108. Guerin S, Burbidge H, Firth E, Fox S. Achilles tenorrhaphy in five dogs: a modified surgical technique and evaluation of a cranial half cast. Vet Comp Orthop Traumatol. 1998;11(4):205-210. Reinke JD, Mughannam AJ, Owens JM. Avulsion of the gastrocnemius tendon in 11 dogs. J Am Anim Hosp Assoc. 1993;29:410-418. Nielsen C, Pluhar GE. Diagnosis and treatment of hind limb muscle strain injuries in 22 dogs. Vet Comp Orthop Traumatol. 2005;18(4):247-253. Stepnik MW, Olby N, Thompson RR, Marcellin-Little DJ. Femoral neuropathy in a dog with iliopsoas muscle injury. Vet Surg. 2006;35(2):186-190. Rossmeisl JH Jr, Rohleder JJ, Hancock R, Lanz OI. Computed tomographic features of suspected traumatic injury to the iliopsoas and pelvic limb musculature of a dog. Vet Radiol Ultrasound. 2004;45(5):388-392. Breur GJ, Blevins WE. Traumatic injury of the iliopsoas muscle in three dogs. J Am Vet Med Assoc. 1997;210(11):1631-1634. Bennett RA. Contracture of the infraspinatus muscle in dogs: a review of 12 cases. J Am Anim Hosp Assoc. 1986;22:481-487. Pettit GD. 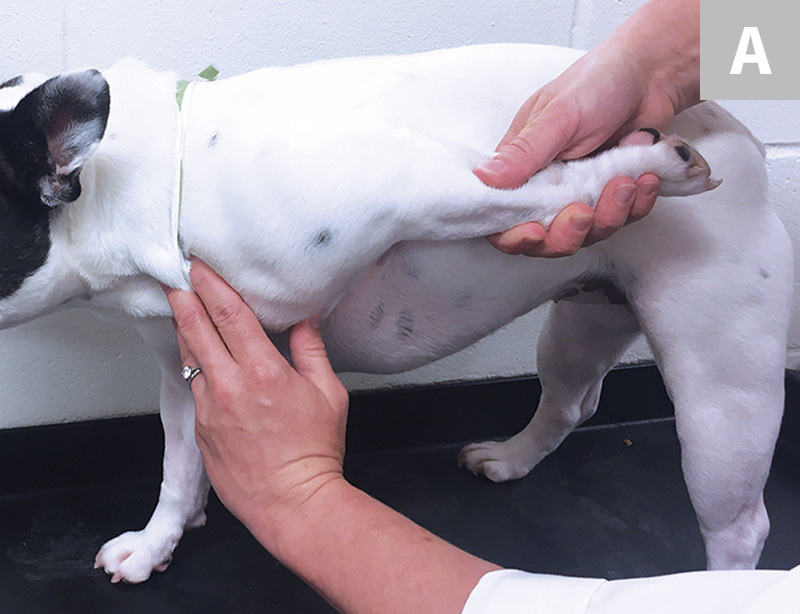 Infraspinatus muscle contracture in dogs. Mod Vet Pract. 1980;61(5):451-452. Harasen G. Infraspinatus muscle contracture. Can Vet J. 2005;46(8):751-752. Devor M, Sørby R. Fibrotic contracture of the canine infraspinatus muscle: pathophysiology and prevention by early surgical intervention. Vet Comp Orthop Traumatol. 2006;19(2):117-121. Mauterer JV Jr, Prata RG, Carberry CA, Schrader SC. Displacement of the tendon of the superficial digital flexor muscle in dogs: 10 cases (1983-1991). J Am Vet Med Assoc. 1993;203(8):1162-1165. McNicholas WT Jr, Wilkens BE, Barstad RD. Luxation of the superficial digital flexor tendon in a cat. J Am Anim Hosp Assoc. 2000;36(2):174-176. Solanti S, Laitinen O, Atroshi F. Hereditary and clinical characteristics of lateral luxation of the superficial digital flexor tendon in Shetland sheepdogs. Vet Ther. 2002;3(1):97-103.